Mass Casualty Incidents: What can we (re)learn? 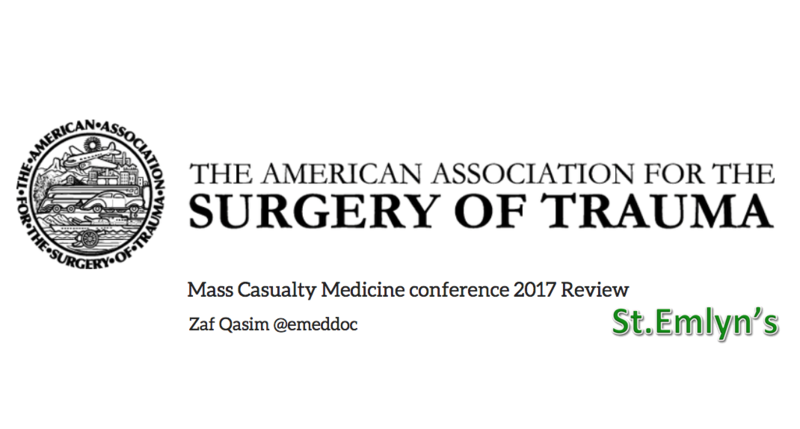 This year, the American Association for the Surgery of Trauma held its Annual Meeting in Baltimore – a city I called home for a while after I moved across the Atlantic a few years ago. It seemed fitting to have it here – while Baltimore is rich in history, it is certainly no stranger to violence. The half-day session had speakers from both the military and civilian worlds discussing their own involvement with mass casualty incidents (MCIs) and provided some key lessons to our own practice. The line-up included legends from the US military and civilian trauma surgery fields. Trauma surgeon Colonel (retired) Warren Dorlac then recalled his most difficult period while serving as trauma chief at Landstuhl Regional Medical Center in Germany, a tertiary care facility where casualties from Iraq and Afghanistan were taken before ultimately being transferred to the US. In November 2004, his hospital received innumerable casualties from Operation Phantom Fury – the massacre in Fallujah. My friend and colleague, Air Force trauma surgeon Major Brocker, spoke next about how a rocket attack to an on-site Afghan jail resulted in multiple injured prisoners flooding his medical facility – just days after he assumed the role of trauma director in Bagram. Be it in Mogadishu, Boston, or Orlando – MCI plans were discussed, reviewed, and practiced with their own teams before they were actually needed. Maj. Brocker’s team in Bagram had just run a MCI exercise days before the rocket attack on his base, and similarly the other speakers emphasized such preparation was critical to their success when these events hit their doorsteps. Several speakers noted they were unaware of the nature or scale of the incident until victims were already in the ED. Facing some of the worst riots the nation had seen, Dr. Scalea described “a really busy night” where “everyone came to Shock Trauma” as EMS just could not reach the city’s other designated trauma centers. The Pulse nightclub shooter killed 49 people and wounded 58 others. With the hospital only a few blocks away, over half of the victims were brought by private vehicle, police car, or even carried in. There was no field triage and no prehospital alert. ORMC received 49 victims in the course of 4 hours. The hospital-wide MCI page did not go off until almost an hour after the first 20 victims arrived. Don’t be distracted by the obvious – find what’s making these people sick! At the start of the MCI, you may receive a high influx of relatively stable patients well before your sickest patient come. In Boston, several initial arrivals were brought in covered in blood – major resources were applied only to find out that the blood was someone else’s and they had no injuries. The most critically injured patients arrived later, some with horrific traumatic amputations. While these were the most visually stimulating injuries, many required management of truncal injuries that were not immediately evident. Critical lesson: look beyond the distractingly obvious injury and utilize an experience clinician to triage. Terrorist tactics evolve – the risk of a secondary attack designed to paralyze the rescue effort is a possibility. We saw this in Karachi, Pakistan where an initial suicide bombing targeted a bus, and a second device was deliberately set off outside the ED where the victims of the first attack were being treated. Dr. Cheatham related that ORMC was locked down soon after the first wave of victims from the Pulse nightclub arrived because there were reports of an active shooter within the hospital itself. Luckily this turned out to be a false alarm. Sometimes the victims themselves may pose a threat to staff. Maj. Brocker described how his team just did not know how dangerous the prisoners were and what risk that carried. Armed prison guards had to accompany victims into the operating rooms to maintain security. An MCI can quickly overwhelm your own resources. The speakers all mentioned how they could have or did utilize other avenues to assist them in their disasters. Col. Dorlac described receiving a multitude of injured soldiers at Landstuhl who were at the end of their physiologic reserve, requiring re-operations and critical care. What ensued was a massive, dynamic triage and management exercise as he often just did not know how many more casualties his team would receive the next day. He regretted not calling in off-duty personnel from allied surgical specialties to assist in this effort. Dr. King praised his Boston blood bank team in rapidly being able to meet his patients’ massive transfusion requirements (131 total units of blood product). Even if this is not something that the team is used to, they will rise to the occasion when called upon. Dr. Holcomb related how in Mogadishu, while under the constant risk of attack themselves, a broad mix of professionals (general surgeons, family physicians, emergency physicians, nurses, and paramedics) relied on their varied experiences to care for over 90 casualties. He emphatically stated that quality trauma care can be delivered in tents. Dr. King further described the heroic efforts of physicians and surgeons who saved the life of a Boston police officer at Mt. Auburn Hospital, a community hospital not used to dealing with trauma. In the aftermath of this devastating act, these professionals did not shy away from the unfamiliar, but came together to give their all. As with everyday emergency medicine, you cannot choose what will walk in the door when a MCI occurs. In Landstuhl, Col. Dorlac found injuries inconsistent with the provided transfer information. Key lessons of being a receiving facility: don’t assume anything; reanalyze and document everything; and carefully consider who may not tolerate another prolonged transfer. After the Asiana crash, Dr. Knudson had multiple casualties and their families who did not speak English and whose loved ones were an ocean away – we faced a similar issue when we received multiple victims from a tourist bus crash. Interpreters were essential. She also discovered an odd pattern of severe metabolic acidosis, hypocalcemia, hypotension and cardiac arrhythmias not accounted for by the crash itself. This persisted for days in the survivors. Eventually it was discovered that the material used in the fire suppression system turned into hydrogen fluoride on heating, resulting in devastating inhalational injuries. All the civilian speakers described their roles of being thrust into the media spotlight. The media are there to get a story but remember you are there for your patients first – I was glad to hear this unifying theme. They suggested having a single designated speaker, and delivering a clear, concise, truthful message – but only after consulting the patients and/or families first. Long after the acute incident has happened, the press has gone home, and the public has forgotten, the toll on the victims and the staff dealing with it is very real and lingers on. Dr. Knudson described how one of her junior residents was deeply affected for months after the loss of one of their patients who was of a similar ethnic origin. Dr. Scalea told us how the rioters came to Shock Trauma’s front door, preventing staff from reuniting with their families after their shifts, not knowing if their children were safe. Dr. Cheatham remembered how the number of victims and the possible threat to themselves from the on-site active shooter alert was a huge psychological burden for his team. Additionally, staff who had turned off their phone overnight only to find out about the nightclub shooting the next day had persistent guilt at not being there to help out. Dr. King remarked on the inadequacy of the improvised tourniquets used to manage prehospital exsanguinating extremity injuries both in the marathon bombing and in subsequent cases. Proper tourniquet use was already common in the military, prompting him to write a controversial article in the Journal of Trauma citing that “our current practice is an approach, lost in translation, from the battlefield to the homeland.” It took several more years of concerted effort locally, and now nationally through the American College of Surgeon’s Stop the Bleed campaign, to have first responders learn military lessons and carry suitable tourniquets. It struck me as each presenter spoke that they could just as easily have given the other’s talk. The incidents spanned almost 3 decades but the lessons were very similar. Dr. Holcomb and I spoke about this afterwards, and he remarked the onus is on us as civilian trauma clinicians to make a concerted effort to understand and implement lessons from the military and other civilian incidents in our own communities. As I scanned the audience I realized that it was a relatively small room, and I was one of the very few civilian physicians there. Next: Next post: Is cMyC the new troponin? Great article. I hope more people learned from these lessons.